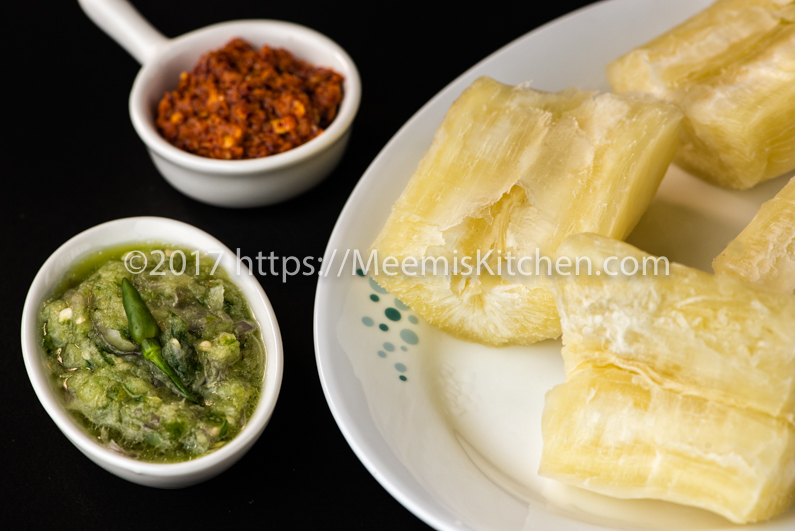 Chenda Kappa or Chendamuriyan Kappa is the special name attributed for boiled Tapioca (drum shaped pieces) relished with Kanthari Ulli chutney or red chilli chutney. The sheer simplicity of this Chenda Kappa/ Kappa Puzhukku is what makes it special and delicious. 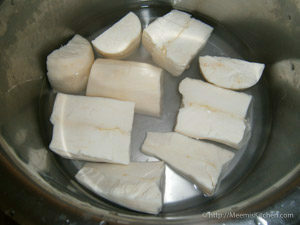 In Malayalam, “Chenda” means “Drum” and since the boiled tapioca pieces resembles drum, it became popular in that name. It is a simple dish of boiled/ cooked Tapioca or Yuca served with spicy chutney. Although everyone might know this recipe, I am posting it just because I loved the photo. All thanks to Anandkuttan for the tasty organic Kappa from his vegetable garden. Tapioca or Yuca is a staple food in Kerala. For all Malayalees all over the world, Kappa is a nostalgic food. Kappa in all forms are very popular, especially Kappa Vevichathu, which is enjoyed with Kerala spicy Fish curry, Kappa Biriyani, the delicious combination of Tapioca and Meat, Kappa Varuthathu, Chenda Kappa etc. Chenda Kappa is the simplest of all. Most of the Keralites grow Kappa in backyards, and relish fresh produce. I still remember the fun we had during childhood, taking out Tapioca straight from the soil. The good old times! Our entire family used to relish (we still do) the butter soft Tapioca and it still is the most popular item during our get togethers. Chenda Muriyan Kappa or Chenda Kappa is best enjoyed with Ulli Mulaku Chammanthi; usually, Kanthari mulaku (Bird’s eye chilli) is used, which is very spicy, mixed with coconut oil that makes it humble yet delicious. Tapioca is also had with Red Chilli chutney. I have added both the recipes, so you can choose your combo. Or you can browse through the fish curry recipes like Kottayam Fish Curry, Alleppey Fish curry, Ayala curry, Spicy Tangy Fish Curry, Fish Masala etc. This is the easiest Kappa recipe and you will surely enjoy!! First, peel the Tapioca skin, wash and cut the Tapioca into small round pieces and cut vertically through the middle. Boil water and add the Tapioca pieces and cook till soft. Insert a tooth pick to check if it is soft. If the Tapioca takes time to cook, cook in pressure cooker. Just before draining, add salt and let it simmer for a minute. Drain and keep aside. 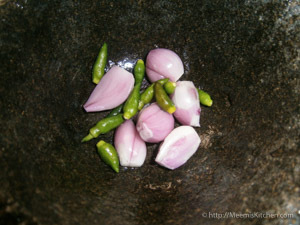 For Ulli – Kanthari chutney, crush the shallots/ Kunjulli and Kanthari or green chilli coarsely. Add salt and Coconut oil and mix well to combine. You may add 1 tsp water or more coconut oil to make it slightly loose. For Red chilli chutney, Heat Coconut oil in a pan and add shallots/ Small onion and fry slightly. Add Red chilies and fry for some time till they change color. Let it cool and grind this and all ingredients together in a grinder with just 1 tbsp water. Mix salt and Coconut oil. Serve and enjoy with Chenda Kappa. Only shallots/ Small onion should be used for Chutney. Use Kanthari Mulaku (Bird’s eye chili) for authentic taste. Coconut oil should be used for best flavors. Some Tapioca needs very less time to cook. Do not use pressure cooker unless Tapioca is too hard. Add salt to the boiling water only after Kappa is cooked. Only Coconut oil should be used to toast the red chilies and shallots for red chutney. If you want a variety red chutney, check this link Unda and chammanthi for delicious red chutney. Hope all of you would try this recipe. Let me know if you like it or share with your friends using the buttons on the side. God Bless!